From left, candidates for Leesburg's Special Election Josh Theil, Gwen Pangle and Neil Steinburg after Monday's candidate forum sponsored by Loudoun Now. 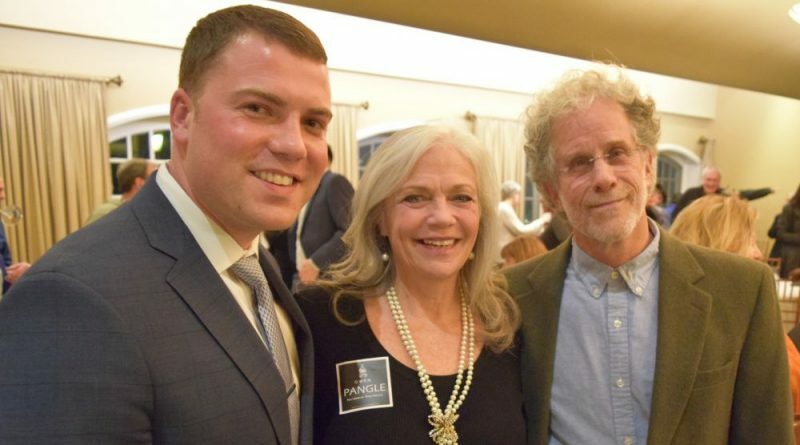 Just one week before Leesburg voters head back to the polls to fill a vacant Town Council seat, a crowd of 150 residents gathered at the Lightfoot Restaurant to learn more about the three candidates. Gwen Pangle, Josh Thiel and Neil Steinberg are vying to serve the remaining three years of the term held by Ken Reid, who resigned because he had accepted a job in the Tidewater area. The election, open to registered voters within the town limits, is Tuesday, Feb. 6, from 6 a.m. to 7 p.m. 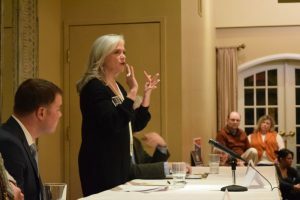 The candidate forum, hosted by Loudoun Now, featured questions on topics ranging from development, to allowances for food trucks, and the future of the county’s Confederate war memorial. A popular topic was the plan by CalAtlantic Homes to build a residential subdivision on the 141-acre Westpark Golf Course property. Under current zoning, a maximum of 27 homes could be built by-right, without Town Council approval. The property also includes 8 acres of commercial land. Neighbors have campaigned to preserve the golf course and oppose the subdivision plans. The candidates agreed that, so far, there is no role for the Town Council in the debate, but they encouraged residents to stay involved as the developer puts options on the table. Gwen Pangle during Monday’s candidate forum sponsored by Loudoun Now. Pangle said the town should respect the property rights of the golf course owners to sell the land and the buyer to develop under the town’s rules. She encouraged those concerned about the project to be proactive and work toward a better result for the neighborhood. Thiel said the town is still waiting to see what the developer has planned and complimented the neighbors for reacting quickly. “I’d like to see as much of it preserved as possible. That’s where I learned to play golf and that’s where I’d like my kids to learn how to play golf,” he said. However, with golf course operations unlikely to continue, he said the town should work to preserve as much open space as possible. Steinberg said that the property’s extensive floodplain makes its “highly unlikely” 27 homes could be built on there under the current zoning. He encouraged residents to wait and see what the new owners formally propose. “It may turn out better for the Westpark neighbors than they currently envision,” he said. He noted that even Westpark neighbors don’t agree on what is the best option. Steinberg said town leaders should stay the course when it comes to downtown Leesburg and economic development generally. He has seen the ebb and flow of the historic district during the past 40 years from the windows of his Photoworks office at the corner of King and Loudoun streets, just across from the booming Delirium Café. Neil Steinberg speaks during Monday’s candidate forum sponsored by Loudoun Now. Pangle, a longtime member of downtown business advocacy groups, agreed the recent changes offer a lot of new opportunity. “We’re all about the food now, rather than the antique shops,” she said. However, there are challenges to restoring historic buildings for new uses and said the town should look at relaxing regulations that make those improvements easier. Thiel said the business revitalization has fostered a youth movement in town and highlights the need for new energy and new ideas in the town’s leadership. He drew a blend of cheers and jeers from the audience when the 27-year-old pointed out his two rival’s gray hair. “I’m going to bring different ideas, different ways of doing business,” he said, adding he wants to focus on reducing red tape and streamlining processes to get businesses up and running. 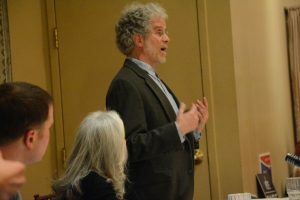 Responding to an audience question, all three candidates agreed that the Town Council won’t have a role in deciding the future of the Confederate War Memorial in the courthouse square, but Steinberg and Pangle said moving the statue to the Ball’s Bluff battlefield would be a good option to consider. “It’s a painful reminder of a painful part of our history,” Steinberg said. Josh Thiel speaks during Monday’s candidate forum sponsored by Loudoun Now. “I think people coming into Leesburg have a perception about what Leesburg is all about. When that lone figure is in front of our courthouse. It’s not necessarily a perception I think they should have,” Pangle said. Thiel said the future of the war memorial isn’t a Town Council issue, but would be solely decided by the Board of Supervisors, and then only if the General Assembly allows counties to alter or move such monuments. The Town Council, he said, should be more concerned with snow removal than removing the statue. 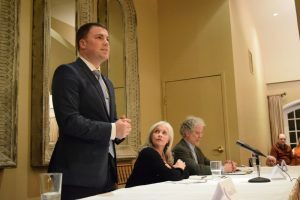 The candidates also shared their views on the town budget priorities, the town’s planning and development polices and food trucks, among other issues. Gewn Pangle has a vested interest in development in Leesburg as a real estate broker. Josh Theil needs to have a little more water under the bridge before he is ready for the Town Council. Neil Steinburg has had a business in Leesburg for 40 years and seen many fat and lean years in this town’s economy. He has the perspective and the support of many in the business community. He’s the one I will vote for. 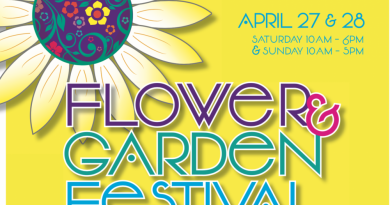 Thanks to LoudounNow for sponsoring this event . I was there and was very pleased at the format. It was more of an evening of conversation on issues rather than a debate, which was good, since as we have seen recently at the national level, debates can be nasty–Neil Steinburg has been in business for along time in Leesburg and knows what has worked in the past and what has not so he has the experience needed. He also showed a thorough understanding of how the town council works (planning and budgeting–budgets at important since they show what priorities are for the town)–you put your money where you think it will do the most good for the citizens of the town. so he knows how the town works. He is ready to assume the seat on the town council right now. Josh Thiel was clearly the most capable candidate with a vision for Leesburg that was clear and will continue to make it one of the best places in the United States to raise a family. A Leesburg native, former NFL player and business executive, Thiel seemed to be the only candidate interested in receiving feedback from constituents and LISTENED. The other two came in with their own agenda and canned answers which indicates to me that this would be their approach if elected. Pangle is generally unlikeable and based on her track record, a VERY difficult person to work with. In my opinion, certainly not someone who is going to move the needle or have the time needed to serve Leesburg. Frankly, it appeared that she was more interested in pushing her business and the last thing we need is another politician using public office to promote personal financial interests. Steinberg…..head in the clouds attitude whose vision for Leesburg is moving statues and not supporting our local small businesses or the residents of Leesburg. I would have preferred to hear about his plan to move trash in Leesburg, not statues as its not within the Council’s scope. It was also clear he didn’t support our small business owners including food truck vendors (who we all love). For each question asked at this forum, Steinberg’s responses were all pessimistic in nature and came with caveats about why things couldn’t or shouldn’t be done. He said it best, he is a theatre buff historically and in my opinion a bad ACTOR. I’m frankly shocked that the LCDC endorsed Steinberg over Pangle, but that’s the decision that they made. We’ll see how things shake out next week! actually, from the back half the room Theil delivered answers that stumbled, fumbled and were ‘on the fly’. As a previous comment was made, Josh needs more time on committees and commissions before he is ready for election. His ‘vote for me’ speech was based on ideals, NFL experience and I really, really like Leesburg. I like Leesburg too, we all do. As far as the statue is concerned, it’s there and I’d hope the Town Council would offer it’s passive and active influence to the BOS and GA. (hint; that is what leadership is Josh). As residents of Leesburg, we are stakeholders in our historical image. To simply say “I want to be on the town council, but the statue is out of my hands” is poor form. Just because Leesburg doesn’t have legal ownership in the statue doesn’t mean we don’t have a say. The trash issue will get fixed. Then there will be another issue to fix as an on going excuse not to address the statue. Gwen and Neil have the situational awareness and experience to occupy a council seat. Almost forgot and surprised it wasn’t covered, but why is no one talking about how Steinberg passively threatened Thiel? After Thiel finished answering the moderators question, Steinberg comes out of left field with a comment directed at Thiel about how he’s a triple black belt in martial arts and some other jibberish. Again, just a sign of how this candidate would carry himself and not someone I want representing me. Steinbergs comment about his black belt was in response to Thiel making an inappropriate comment about Pangle and Steinbergs age with references to their grey hair. (paraphrased; I’m the only only one without grey hair.) It was a cheap shot that they are too old and an effort to self aggrandize himself as the young gun candidate. (That kind of trash talk might work on the football field, but not with my tax dollars.) It backfired instantly and many in the room, grey haired themselves, didn’t receive it well. Thiel lost votes instantly after that comment. Steinberg responded to the ‘grey hair’ comment saying he is a black belt .. meaning he is fully capable and age is not a factor, grey hair or not. It wasn’t a threat at all. Simply a response to Thiel’s verbal attack on older people. It was representative of the issues in general that night. Thiel has a good heart and intentions but limited experience, somewhat naive. Prangle and Steinberg have a deep understanding of the economic and societal issues in Leesburg. Steinberg wasn’t pessimistic rather pragmatic. He objectively looks at the issues weighs the pros and cons and makes his point. Specifically when it came Leesburg taxes, he basically stated, ‘do we get good value for our taxes? ?’ If not, then what do you want to cut? Water? Sewage? Ida Lee? The Democrats have two great choices between Gwen and Neil. Both will ask no questions about how your tax dollars are being spent. Both will let Town Staff do what they want, good or bad, with no questions. Both support all liberal issues that have ZERO to do with local government. Both have waited decades to step up and consider public service. If you vote Democrat just to vote Democrat then you have two choices. When you need Town services like streets or sidewalks fixed, or trash and brush picked up you will not call a political party. You will call the public official who will hold Town staff accountable to provide those services. JOSH THEIL is the only candidate for everyone who wants government work for them and not just take from them. JOSH THEIL is the only candidate who can brings new ideas and is committed to a life filled with public service. JOSH THEIL is the only candidate who will stay focused on local issues of clean and safe streets, and Town services provided fairly and effectively for all of Leesburg. The current weak Council is heavily weighted to do as Town staff wishes not how the public wants things to be done. If you want a Council that works for YOU then You need to vote for JOSH THEIL! I completely agree with Josh that the town council needs to focus on issues like snow removal and not statue removal. I am looking forward to him bringing more ideas to the town. The economic growth of this town depends on attracting young families. He is the candidate with the correct focus.